Stacey Hill is the mom behind Truly Custom Cakery in Warminster. She's a Philly Social Media Mom and also an award winning cake baker! She bakes out of her house and yet has time to be a mom, feed the fish & win awards! Stacey picked up 3 fabulous awards at City of Hope's 'Let Them Eat Cake' Event this past year, the first year she ever competed! I have to tell you..She's amazing. I truly mean that! Stacey made my son's birthday cake and it was the hit of the party!!! 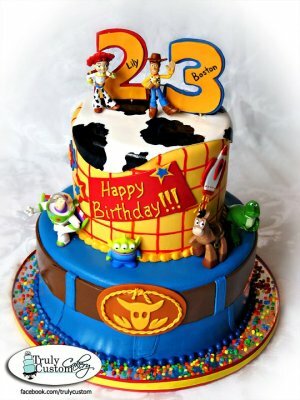 She's an awesome artist and so kindly made a fab cake for Boston that includes his character...WOODY! !